Cg Harrys Game (outside), under jockey Robert Burney, drives to victory in the $32,300 Far West Futurity on Portland Meadows' Sunday race card. PORTLAND, OR—NOVEMBER 4, 2018—Gc Harrys Game broke well under jockey Robert Burney to defeat L Bar D Top Prospect by half-a-length in the $32,300 Far West Futurity Sunday afternoon at Portland Meadows. Saddled by trainer Scott Chumbley, Gc Harrys Game completed the 350 yards in :17.864 seconds, a 99 speed index over a wet fast surface into a 3 mph crosswind. Racing for Connie Chumbley, the Oregon-bred son of Carters Cartel, from the Game Patriot mare Ez Gamer, has compiled a (6) 2-0-2 record this season and the $12,920 Far West winners' purse boosted his bankroll to $16,318. Bred by Gary Chumbley Estate, Gc Harrys Game broke his maiden in the October 21st trials, was 3rd in the Grants Pass Firecracker Futurity Consolation and 4th in the Pot O'Gold Futurity consolation earlier this year. Runner-up L Bar D Top Prospect picked up $5,491 for his second-place effort. Jockey Jaime Lopez had the riding call for trainer Hector Magallanes. L Bar D Top Prospect is a homebred son champion Prospect To The Top racing for Jose Louis Torres and Chris Carpenter. Darrell and Linda Sanders bred the sorrel gelding in Oregon from the Ought To Be First mare Be First Rose. 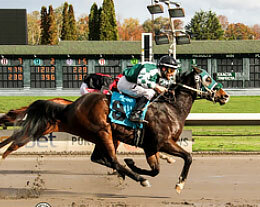 L Bar D Top Prospect was also 3rd in the Firecracker Futurity at Grants Pass last summer. Malon Cowgill's Washington homebred Alabama Hills finished three-quarter back to earn $3,553 for third. Benito Curiel trains the Brookstone Bay colt out of Tombstone Tina by Jess Louisiana Blue. Jose Figueroa had the riding call. Completing the field were Er Cartel, Ima Five Bar Cartel, Willy B Gone, Kountry Fun, Loosin My Lover, Kr Red Hawk and Juan Funnybunny.